Stock Markets: Domestic Institutional Investors Vs Foreign Institutional Investors.. In Indian stock markets, apart from retail or individual investors, threre are 2 types of institutional investors take part. 1. 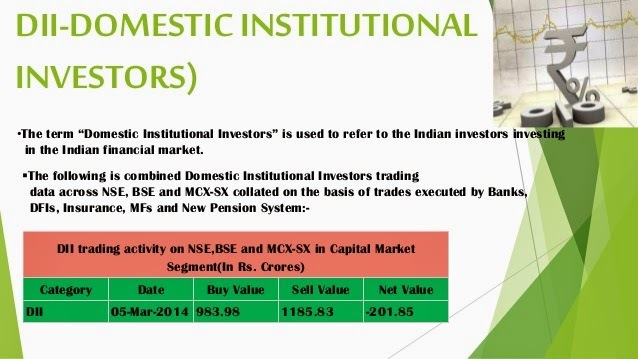 Domestic institutional investors (DII). These are financial institutions like banks, insurance companies (Both General Insurance and Life Insurance ),Central and state Govt financial institutions such as pension funds. They invest their surplus money in share markets under the guidance of their expert committees & advisors. DII also subscribe to new issues Initial public offerings (IPO's) and follow on public offers (FPO's) .They usually select blue-chip company shares. When their investments go up in value they sell & make profit. But, some occasions they lose also, because of bad economy & bad performance of such selected companies. But, since their investments are usually in bulk, they ultimately earn profits. 2. Foreign institutional investors/ or Foreign Portfolio investors(FPI). These are institution from outside India. When they sense low or / attractive values in India's share they invest in bulk and get out of the markets when they see profits or, they feel that someother country's market is good to invest compared to our Indian country. These institutions operate on International level, and hence their buying or / selling in our markets make more upward or downward movement in our country's share markets.